In version 9, you can set up list templates for checklists that are relevant for all your various projects. Create a checklist first, that you would like to use in a project of your choice. To learn how to create a new list see Create a new list. Save the list as usual. To export the list as a template, click on the Export Template button on the Templates tab. You can save the list for further use as an InLoox list template file or as a CSV- or XML-file on your computer or your file server. To use the list in another project, please open the project in which you want to use the list, then click on the Lists button on the Start tab, then click on the Templates tab. Click on the Import Templates button and select the regarding list template from your computer or your file server. Alternatively, you can save the list template directly in InLoox PM for Outlook. To do so, please open the list that you want to save as a template and click on the Templates tab on the Save Template button in the Ribbon. Now, the list template is available directly in InLoox PM for Outlook in the Lists section in the project on the Templates tab. 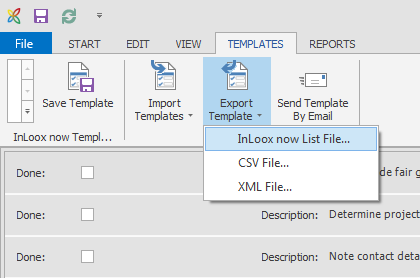 Create a list template in InLoox PM 9 for Outlook • Copyright 1999-2019 © InLoox, Inc. All rights reserved.